In the News: Durham Distillery, Old Nick’s Spirits, Gibbs Hundred Beer, Topo Organic Distillery, Old Mecklenberg Brewery, Shelton Vineyards, Great Wagon Road Distilling Company, Crude Bitters & Soda. Meet the Maker: Eric Swaim, co-owner talks about the history of Hoots Roller Bar & Beer Company, including the origin of the name, where they’ve gone, where they’re wanting to go. Hoots is very ingrained in the community of Winston-Salem and the feelings are reciprocated. You’d be hard pressed to find a local restaurant in Winston-Salem and areas in close proximity that doesn’t carry at least one Hoots beer. Their beers are delicious. 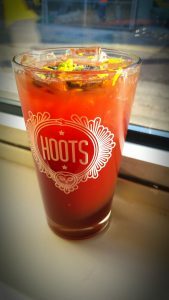 We’re proud to call Eric and Hoots friends of ours. We drink their CocoMorita and Golden Mild.